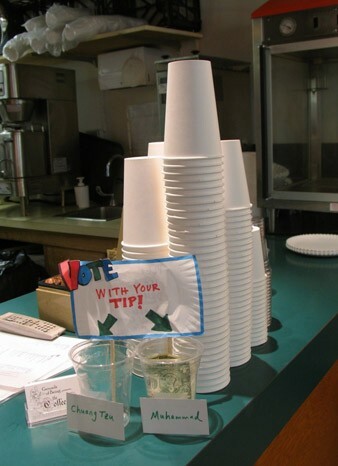 Check the tip jars next time you visit the Grounds of Being coffee shop in the basement of Swift Hall, underneath the University of Chicago's Divinity School. Last week, writing at UChiBLOG, Jenny Fisher found a tournament pitting "the prophet Muhammad . . . against Chuang Tzu, a Chinese philosopher from the fourth century BC, considered by some scholars to be an early anarchist and known for his Daoist writings. . . . Each week patrons vote with their tips, and whichever deity (broadly defined) brings in the most bucks moves on to the next round. As of Wednesday morning, Chuang Tzu was ahead $5.88 to $4. But there was a whole dollar in Muhammad’s tip jar that had yet to be counted in the day's-end tally." Surprisingly, total tips haven't increased. The candidate deities are indeed broadly defined--the list includes J.K. Rowling. Richard John Neuhaus probably wouldn't like the ambience, and might even have a problem with D-school, period. "The whole idea that there is such a category of human belief and action that can be fitted into the category of 'the religious phenomenon' is misbegotten," he wrote recently in his magazine, First Things, trying to place his own allegiance on a higher plane than anyone else's.